A San Diego woman counts herself among the blessed 25,000 people worldwide who got tickets to see Pope Francis when he visits the United States later this month. 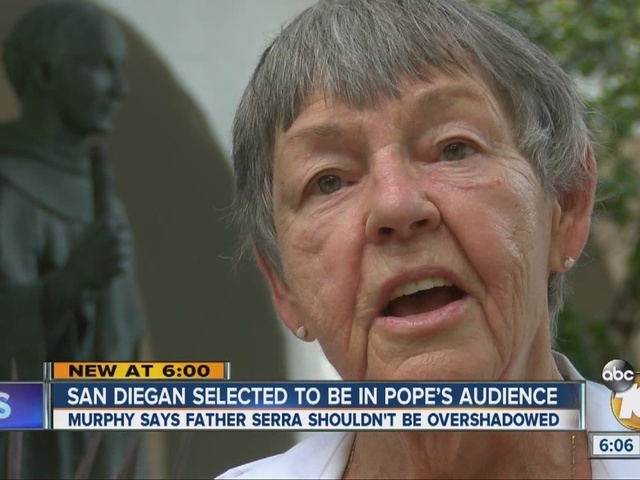 Florence Murphy was told last week she was selected to receive two tickets to the canonization ceremony of Father Junipero Serra and the Pope’s address before a joint session of Congress. 10News viewers may remember Murphy as the “Jacket Lady”. She buys dozens of orphans jackets every Christmas. The devout Catholic has attended church at Mission San Diego since moving here in the '80s. It’s one of the nine missions Father Serra founded more than two centuries ago. Imagine Murphy’s joy when she found out Pope Francis would make Father Serra a saint and he’d perform the ceremony in the United States. It’s the first canonization ceremony in the United States ever. People are usually named saints at the Vatican. “I was going no matter what,” declared Murphy. She booked her flight and got a hotel room in Washington, D.C., where the pope will also address Congress for the first time. She then entered a lottery with her church for tickets to see the Pontiff. She has two of the 25,000 tickets available worldwide. Murphy said she’s leaving for D.C. a couple of days before the Pope arrives.